In a footnote to an earlier post about brass band music I mentioned John Ireland's A Downland Suite which was composed for the 1932 National Brass Band Festival of Great Britain. Some years later Ireland transcribed the two middle movements for string orchestra giving them the title Minuet and Elegy (A Downland Suite). 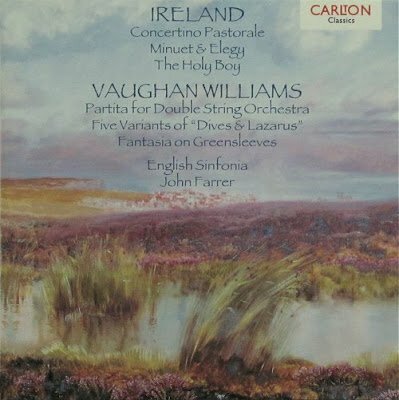 Ireland's transcriptions appeared on the CD above in a particularly felicitous coupling that includes Ralph Vaughan Williams Five Variants of 'Dives and Lazarus'. It is not only the coupling that is felicitous on this now deleted Carlton Classics disc - the performances of this quintessentially English music are as convincing as any I have heard. Which gives the lie to the received wisdom that only English maestros can extract the odour of cow pats from English music, because the conductor is John Farrer - an American. The recording was made in 1996 by legendary producer John Boyden with the English Sinfonia in St Giles, Cripplegate, London. My research tells me John Farrer was born in Detroit, Michigan and is music director of the Bakersfield and Roswell (NM) symphony orchestras as well as principal guest conductor of the English Sinfonia. There is a useful interview here, and any more information about him from readers, Stateside or otherside, is welcome. John Ireland's music was heavily influenced by the Welsh mystic and author Arthur Machen whose White People was republished recently in a Penguin Classics anthology of his writing. More on Ireland and Machen in the 'Secret Life of an English pastoralist'. Thank you for illuminating the recording, and especially for the information about the conductor. I knew him only by reputation and had no idea he was American. Nick, thanks and my error entirely - now corrected. I was principal trombonist of the Bakersfield Symphony Orchestra under John Farrer from 2008-11. He knows the sound he wants from the orchestra, and he knows how to get it out of them. It was a real joy and privilege to work with him.